You might consider replacing your fireplace mantel if it is old and outdated with stains, chips, or other signs of damage. There are also times when your fireplace mantel is still in good condition but you wish to remodel your mantel, or there may be times when you wish to remodel your room and the mantel needs to be updated to better suit the new style. Try changing your fireplace tools and accessories. Tools are available in a variety of colors and styles. There are many types of decorative screens that can be placed in front of the fireplace opening that can help your fireplace mantel to appear a little different when viewed with the new accessories. Try decorating your mantel. Most decorations can be changes as often as you wish to provide an entirely new look to your mantel and fireplace area. Special photos, vases, and knick-knacks are popular. You could also choose to add natural arrangements made out of flowers, greens, or sticks, depending on the season. Make sure you use mats under objects and hang items with hardware that is fireplace friendly. Major changes to your mantel may not be possible without assistance from your mantel provider. 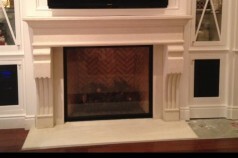 If you need some assistance with your fireplace remodel in Orange County, SoCal Fireplace Mantels can help. From accessories to help update to entirely new mantels and overmantels, you can find a way to improve the appearance of your fireplace that can have a positive impact on your entire room.